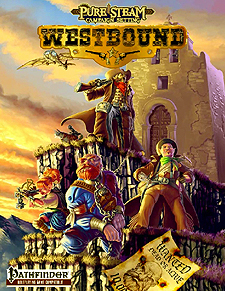 Westbound is the encore offering from the makers of the Pure Steam Campaign Setting. This 160-page volume boasts a new twist on classic races, new classes, archetypes, and feats to build your perfect Wild West character in the Age of Steam. Load out your character with daring new Steampunk equipment technology, and vehicles. GMs will challenge players with new monsters. NPCs, and adventure hooks. Immerse yourself in the Ulleran West with new regions, settlements, and factions. Westbound has everything you need to take your game into the wild unknown.